Bomb-sniffing dogs patrol the building as Capitol police conduct security sweeps before the State of the Union address. Camera crews set up their equipment in Statuary Hall outside the House Chamber in the hours preceding the speech. Senators and representatives later entered the chamber through the roped-off aisle. Sen. Marco Rubio, R-Fla., speaks with reporters in Statuary Hall. Later, he posed for pictures with senators and representatives and their invited guests. White House Senior Adviser Valerie Jarrett tweeted support for Obama's proposals during the speech, including his core message of compromise. 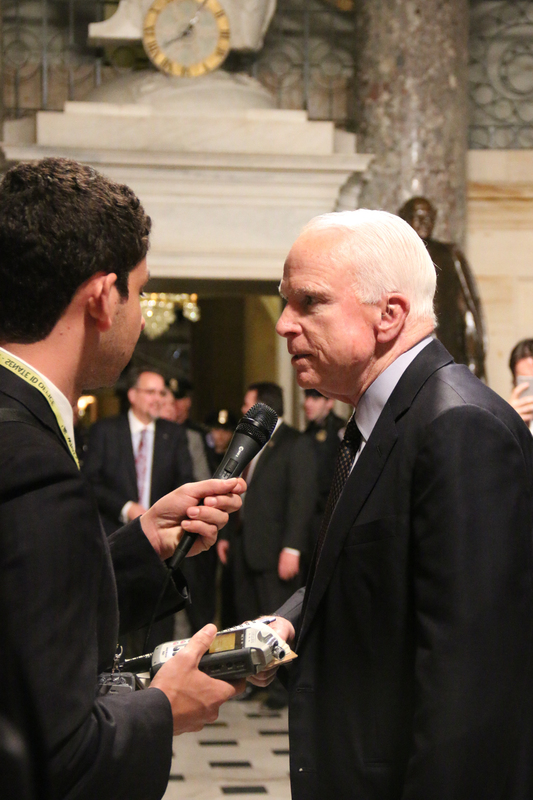 Sen. John McCain, R-Ariz., stops to speak with a reporter while walking back from the House chamber. Speaker Paul Ryan passes through Statuary Hall for his first State of the Union as leader of the GOP. Secretary of State John Kerry, in the midst of a turbulent week of U.S. foreign policy, heads to his seat. Supreme Court Justice Ruth Bader Ginsburg walks through Statuary Hall en route to the chamber. Vice President Joe Biden and Senate Majority Leader Mitch McConnell share a laugh before the State of the Union. Vice President Joe Biden greets press members with smiles as he walks through Statuary Hall. Presidential hopeful Sen. Bernie Sanders, D-Vt., walks toward the House Chamber. The remaining members of Congress and their staff line up in Statuary Hall while they wait to enter the House Chamber.